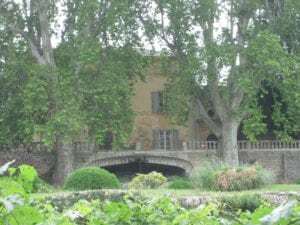 Exploring Luberon in The South of France ~ Often “the destination” itself guides me on my pathway for a trip, yet this time my itinerary was inspired entirely by a movie! 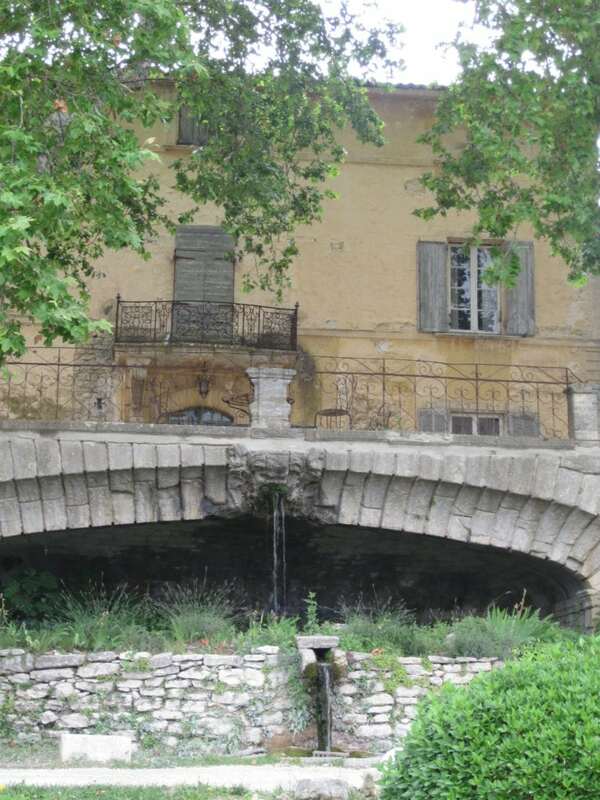 I wanted to re-trace the steps and locations featured in the movie “A Good Year.” Join me on this fanciful adventure as we meander our way through the south of France, and see the impressive haunts and hideaways where this mesmerizing movie was filmed. 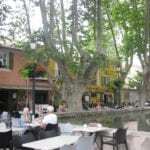 The Movie- As a loyal fan for many years of travel writing author Peter Mayle (of A Year In Provence fame), I had thoroughly enjoyed his antics in the book A Good Year, which was published in 2004. Then in 2006, Twentieth Century Fox released the movie of the same name— starring Russell Crowe and Albert Finney. I was so captivated by the quaint villages and dramatic cinematography that I started researching each and every spot where the movie had been filmed. The various settings complemented the storyline so perfectly. The scouting team did a superb job in uncovering the perfect locations. I just had to go see all of them! 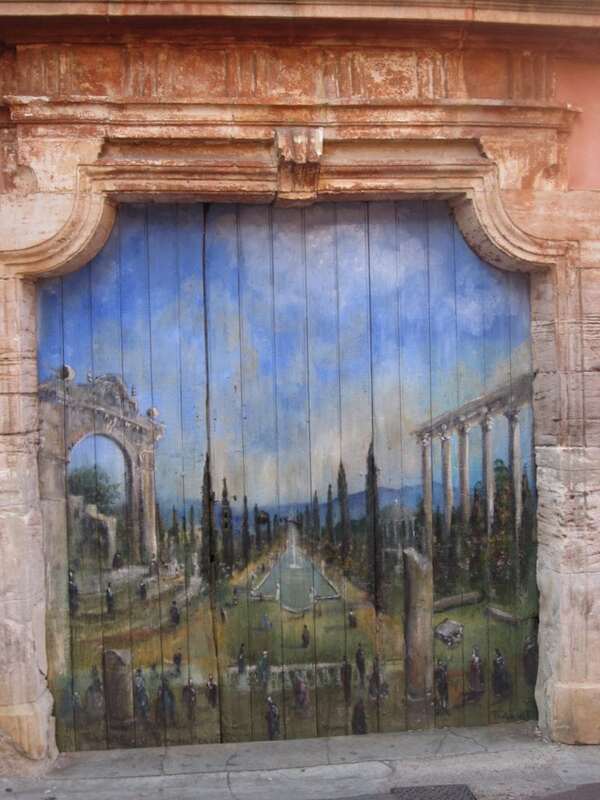 The movie was shot in the Luberon region of France. Although this is not a particularly well know area of Provence, it is a very special place indeed. 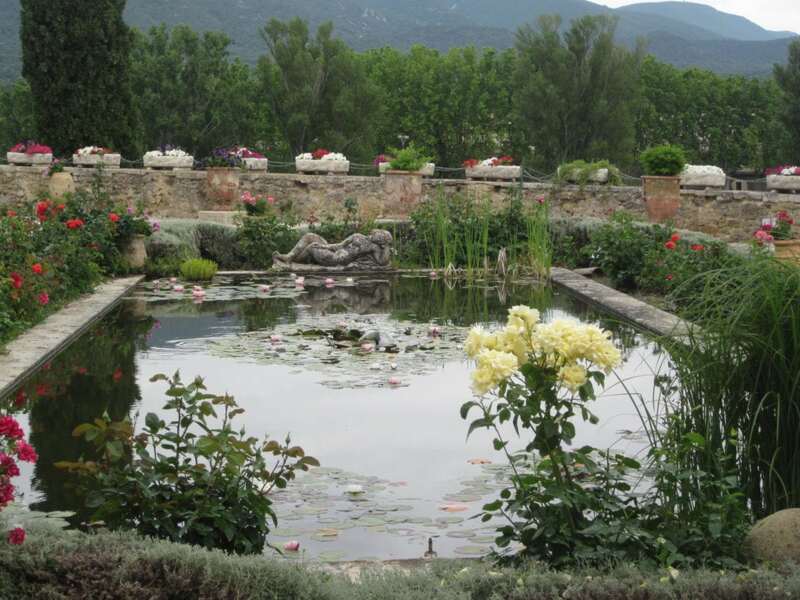 Located just east of Avignon and north of Aix-en-Provence, the movie’s list of locations was long and detailed. 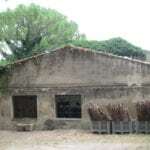 The Villa and winery, central to the flashback scenes, was a 200 year old working winery and yes, it is still in operation today. The movie provided an excellent interpretation of the novel, which, as you know, is not always the case. The tale begins with Max Skinner, a successful London investment broker, who is suddenly summoned to his Uncle Henry’s winery in the south of France for the reading of his will by the town Notary. The movie offers many creative flashbacks to delicately fill in the history-line between Max and his Uncle over the many years. The winery had a few colorful characters of its own—working the land, and of course, a love interest. The character Fanny Channel (played by Marion Cottiard) lived in a nearby town. She was a waitress in the village, and upon his visit, managed to catch Max’s eye. Little did he know they had met many years before, as was revealed later in the movie.The plot thickens, right? In Max’s profession, no one dares to “take holiday” for fear of being replaced. Therefore, his time at the Chateau was to be expedited post-haste. 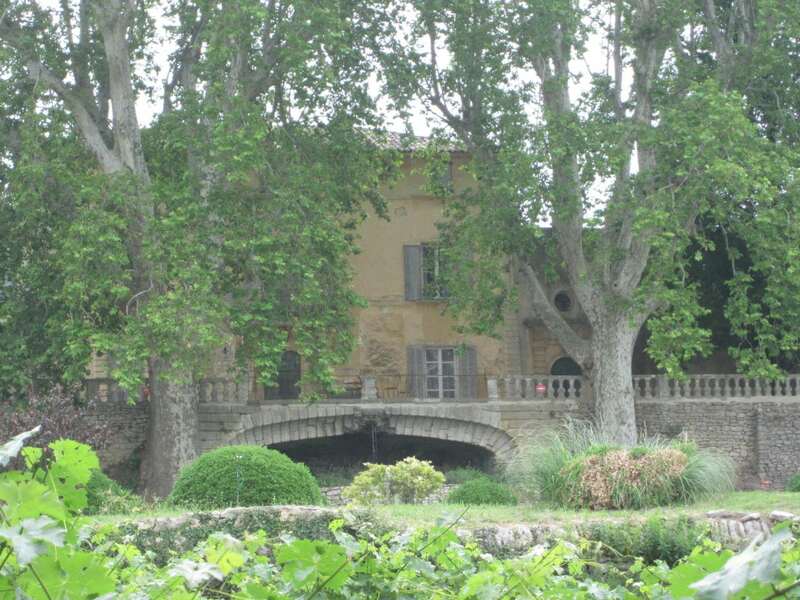 His goal was to quickly make repairs, list the Chateau with a broker, and sell the estate as quickly as possible. However, juggling between London and the south of France, things just got in the way of his big plan. Learning about what was important in life, was woven throughout the story, and Max took an unintended crash course. 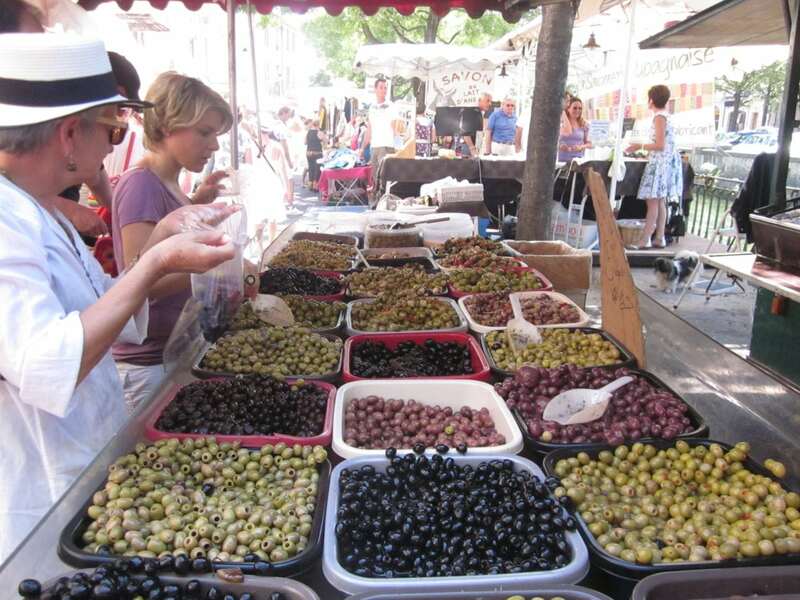 As we left Avignon and headed east on Route D-900, our mid-day fun unfolded. Sometimes that is the joy of exploring a new place—a chance to discover the hidden treasures. 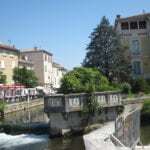 The town of L’ Isle-sur-la-Sorgue (honoring the Sorgue River) runs right through the town. And this small enclave and is a-buzz with activity all-day-long. 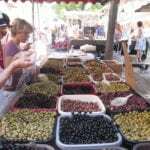 A Farmer’s Market is held every day of the week— meandering along a stream and connected by petite bridges, and walkways. What a pleasant surprise! At one time the river featured 9 waterwheels —-used for the silk and fabric industries. 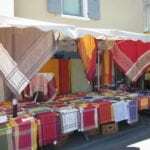 Today, tourism is their hallmark, and many locals arrive from outlying towns as well, to do their marketing. 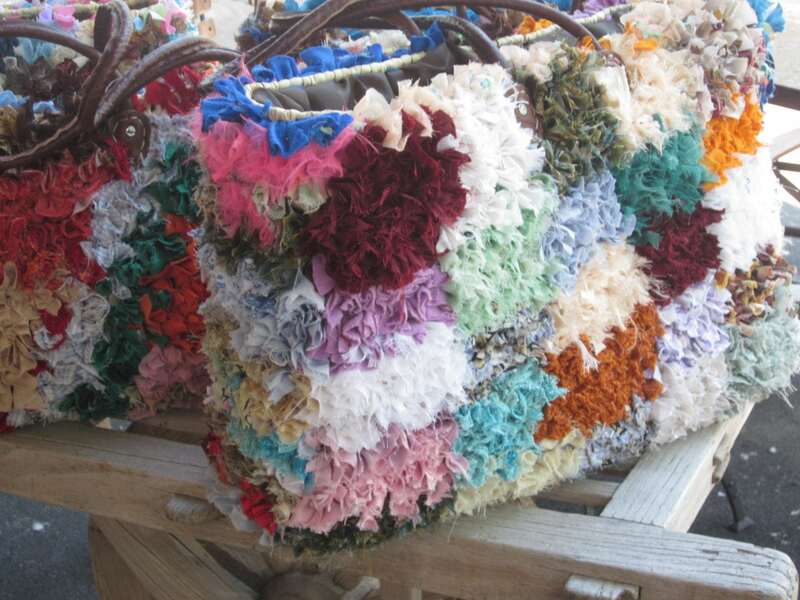 From fruits & vegetables, to cheese, fish, flowers, lavender potted plants, French linens, fragrant soaps, shoes, purses, hats and everything in-between. We sauntered up and down the pathways of endless shopkeeper’s wares. We were shaded by graceful trees and entertained by the gentle streams and quacking ducks along the way. 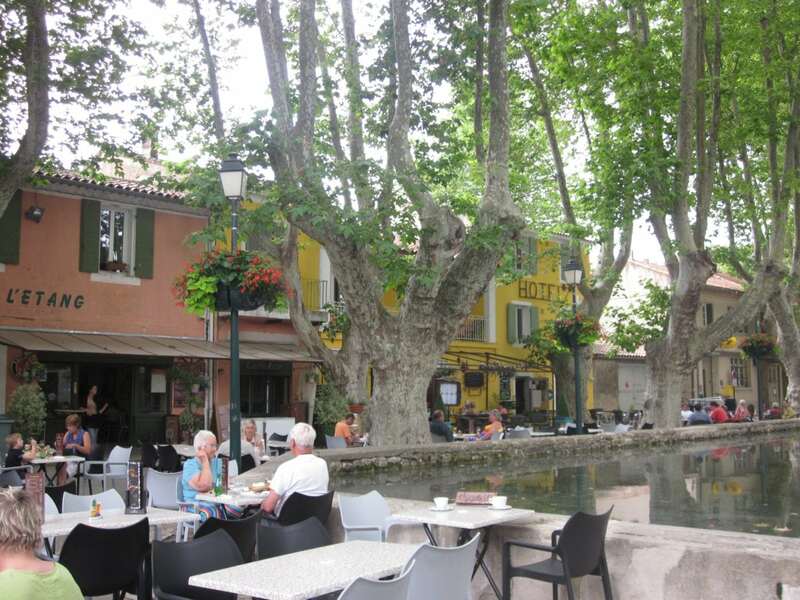 Some visitors even start from the nearby town of Fontaine-de-Vaucluse and paddle a canoe down into L’ Isle-sur-la-Sorgue. 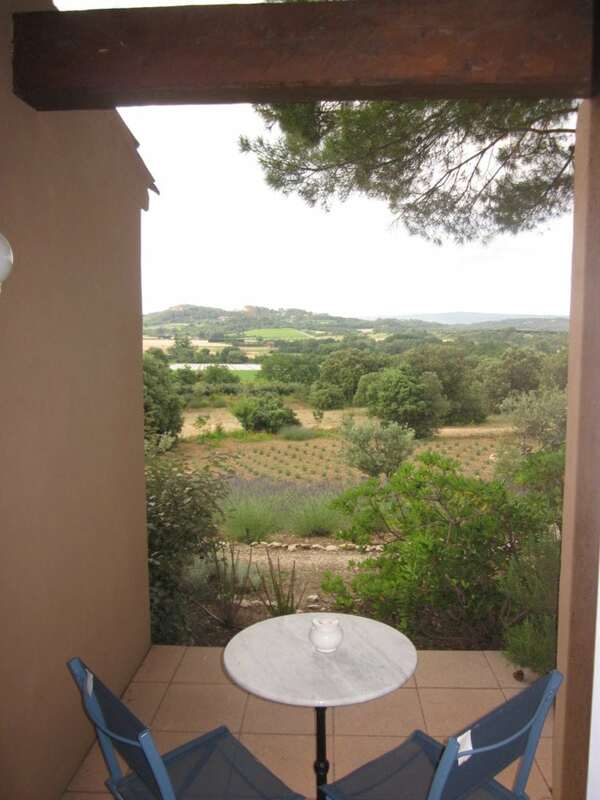 Luberon features two mountain ranges of dark brownish red soil, with an expansive valley floor anchoring the two. In the flatland—- fields of Lavender abound (in the late spring and early summer months) as well as cherry trees, and vegetables of all types. Both hillsides are dotted with small villages. 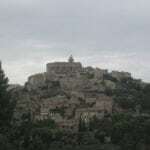 On the north hillside tucked below the Plateau de Vaucluse (pre-alps) are the towns of: Gordes, Joucas, Cadenet, and Apt. On the southern hillside, which stands much taller, was the town of Roussillon. 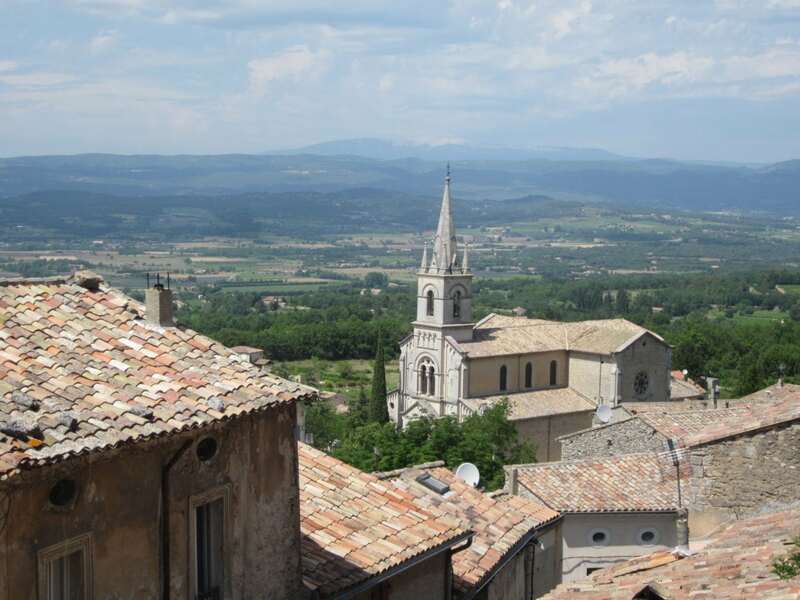 Just beyond that in a southwardly direction in the Montagne Du Luberon (mountain-range) are the towns of: Bonnieux, Menerbes, Lacoste and Cucuron. Roussillon is the second largest of the towns (with Apt being the largest but don’t bother, as it was quite uninspiring). Most of the towns are one small street that literally weaving its way through the center of town, and I would hold my breath in the car, with buildings so close on either side I would have to grab the mirrors and whisk them to the side as we glided past. Our hotel was the perfect jumping-off point for this adventure. 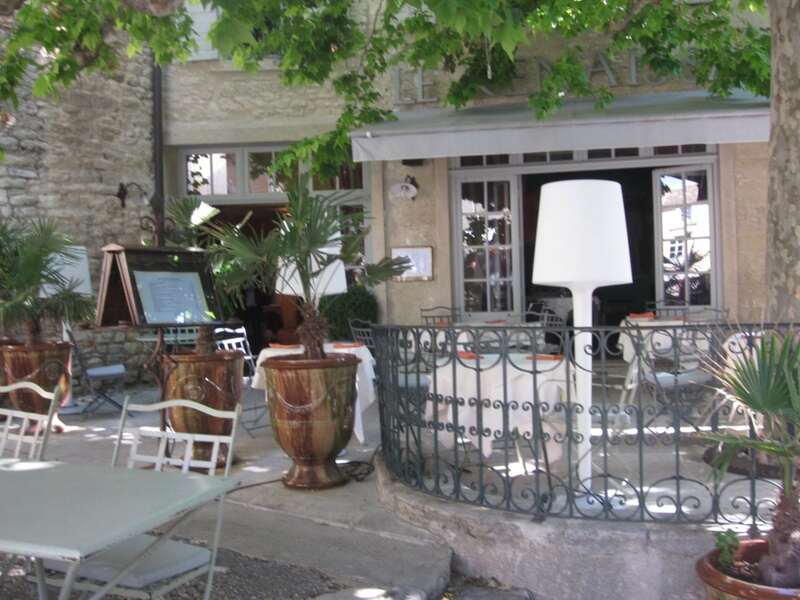 The Hotel la Cle des Champs is located a few miles from Gordes. There are nine guest rooms with patios. 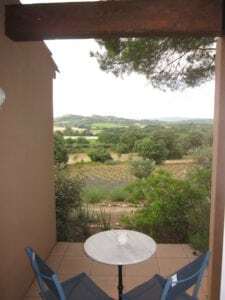 Some look out to a manicured lavender hillside, while others enjoy views of Roussillon in the distance. In the central courtyard, an inviting pool, patio, and sauna area can be found. Breakfast is included, and served each morning on the patio, with special requests always welcomed. Wine and cheese can be arranged in the afternoons, with personal selections made from their wine cellar. Owners Gilles and Monique are an extremely hard-working couple and made our stay so lovely and comfortable. One evening we had requested a Provencal-style meal at the Hotel. It was one of our most favorite meals of the trip. The table was set on the patio near the sparkling blue pool. 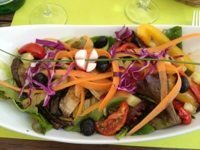 Our menu included: a starter plate with a selection of local sliced tomatoes, goat cheese, basil and olives. The amuse bouche was a basil sorbet. The main course was a chicken leg baked with olive oil, tarragon and was served with potatoes, green beans and small tomatoes—fresh from the vine. This was followed by a cheese plate and for dessert an ice cream souffle with a hint of Grand Marnier. Across the Valley and climbing up the red rock mountains, we explored the second largest city in the area—- Roussillon. Visitors park in one of four parking lots on the edge of town and hike to the small town of shops and cafes all hugging atop the hillside. 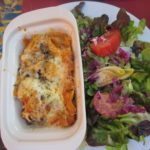 It is a lovely town and we enjoyed quiche, salmon, salads and pizza perched on the outdoor patio of Comtoir Des Arts Cafe & Restaurant. Exploring the Locations Used In The Movie- Slap. Take One. 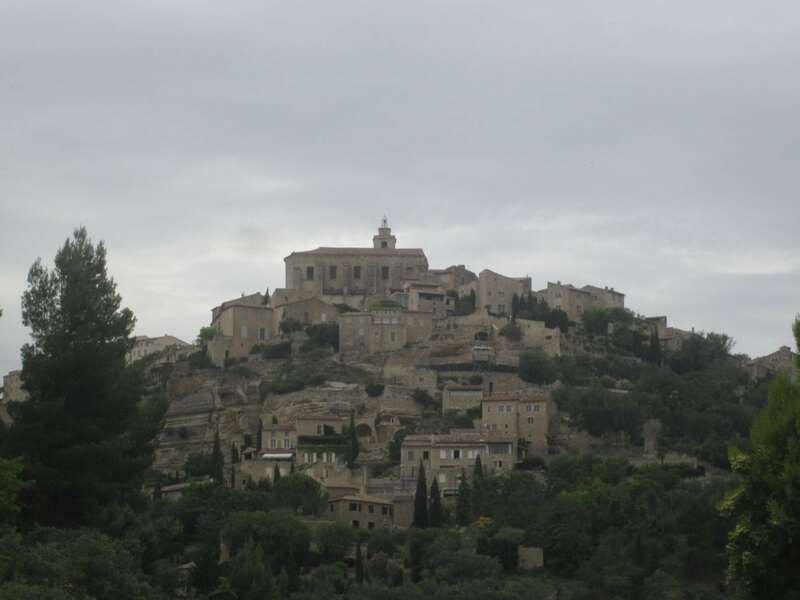 Gordes- The town is constructed atop a hill, with a round-about in the center of town. The beautiful stone buildings appeared to be painted with the warmest white-washed yellow hue. It is a very compact and charming town. We were on the hunt to find the Bistro….We were searching for the restaurant where Fanny had worked in the movie, and where Max had sat sipping a glass of wine and waiting for her to get off work one evening. hotel (Hôtel le Renaissance) tucked away next to the Chateau and Tourist office entry. On Tuesday this area is filled with a Farmers Market. The outside patio (at Hôtel le Renaissance) was used as Fanny Chanel’s Bistro for the movie. 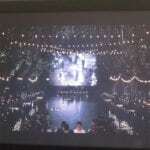 It is such a small space and was made to look so large with the various camera angles used. It was filled to the brim with activity and diners, and to see it now it looked so tiny! 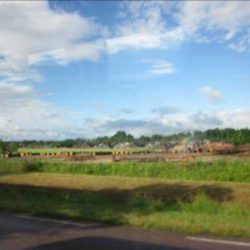 This location was seen several times in the movie. 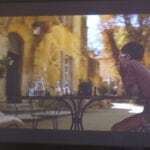 If you look closely in the movie, you can see Nathalie Margan and her father Jean-Pierre from Chateau La Canorgue at a table during the scene where Max waits on the tables. They had the opportunity to be extras in that scene. The fountain (in the square just adjacent to the Hôtel le Renaissance), is where Max waits with a glass of wine until Fanny gets off work. The Main Square and War Memorial (in the center of town) is where Max drives in circles in his rented Smart car looking for the Notaire’s office. 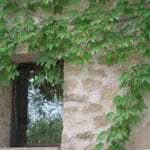 Nearby is the Chateau Les Eydins, which can be rented out by the week. This home was used in the movie as the Wine Maker’s home and garden. Bonnieux– This tiny postage stamp of a town offered one of those “one way streets” described earlier. In the movie, there are several panoramic scenes were Max is looking from Bonnieux over the mountains to the nearby town of Lacoste. The Château la Canorgue, about a mile from Bonnieux, was used as the site of the chateau and vineyard Max inherits. The Chateau is on down a long driveway with a lovely pond and garden below. The winery is to the left and inside the tasting room they proudly feature framed pictures of the location scenes while the movie was being filmed there. As I walked around the grounds I could picture the various scenes. It may sound silly, but it was magical to me. 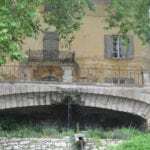 The entrance to Canorgue(on the road between Bonnieux and the Pont Julien) is where Max first arrives at his inherited chateau. The stone marker in that scene is the actual marker, though the name was altered for the movie. 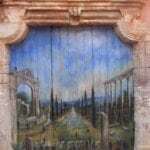 The real name is “Cotes du Luberon” and was a summer home of Popes. Pont Julien is a must visit too along the path, as it is a beautifully preserved Roman bridge that is over 2,000 years old. 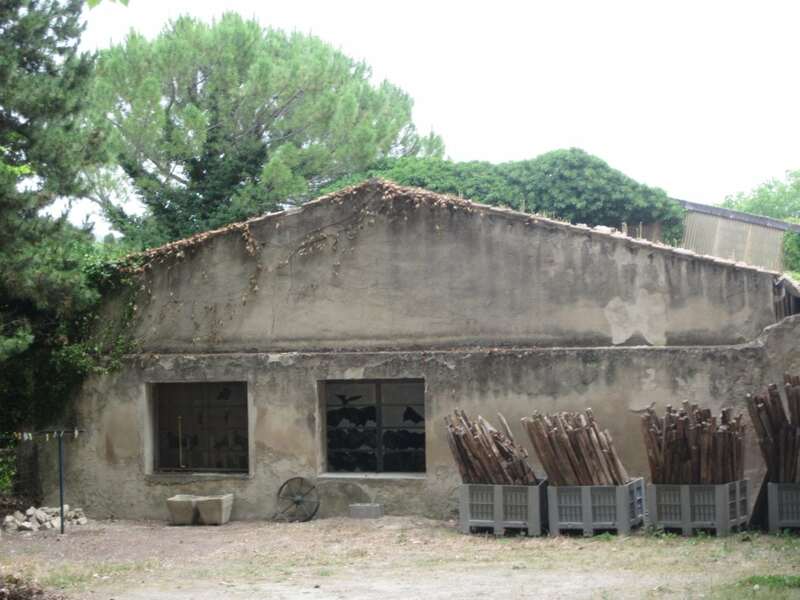 This acclaimed Côtes du Luberon is a 200 year old winery, located about a mile outside the village of Bonnieux. 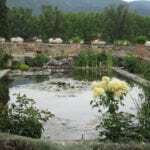 It is well-known for its fine organic wine and sits on 45 hectares (117 acres). 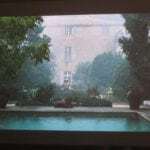 The crews filmed inside the château and outside in the vineyards and garden. 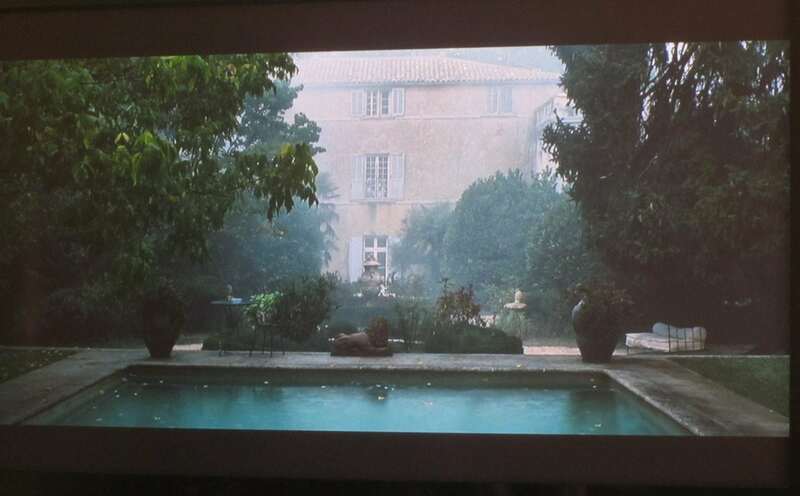 The Canorgue swimming pool was featured as a major scene in the movie. The character Max fell in and couldn’t get out— despite his best efforts. He was later rescued by Fanny (Marion Cottiard), who he had earlier run off the road. I was looking around for the infamous swimming pool and was shocked when the winery staff explained the story to me. The existing swimming pool was not deep enough for Max to be trapped at the bottom, and it didn’t have the water jets that were important to the scene. 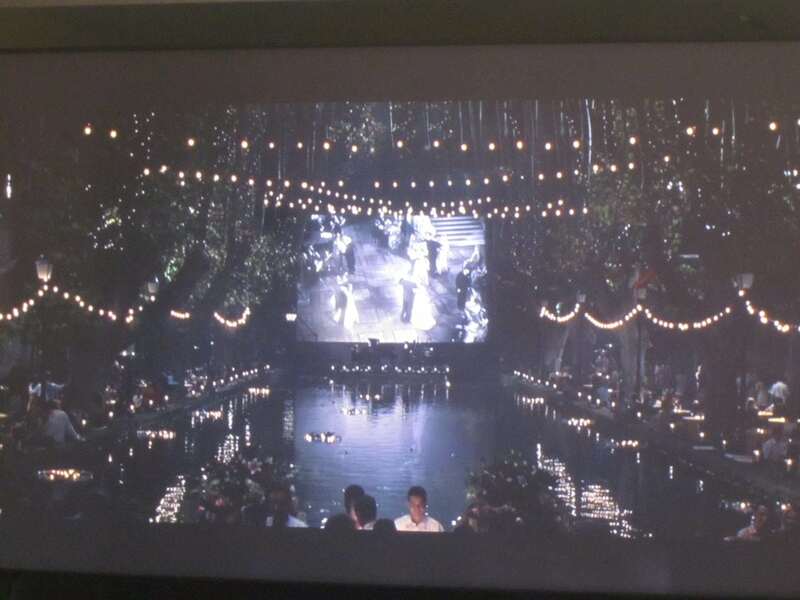 So a second, deeper swimming pool was constructed in the vineyard and it was used just for the movie. 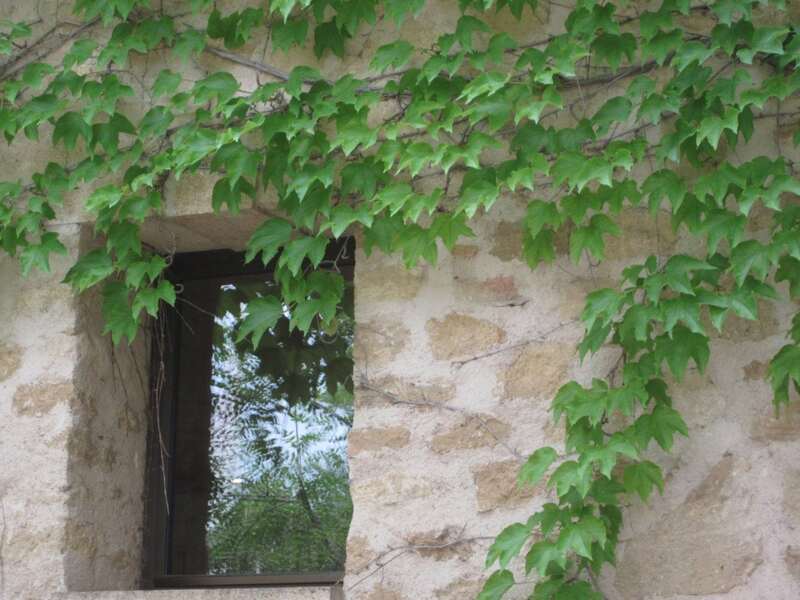 After the filming was completed, it was covered over and replanted with grapevines. What? 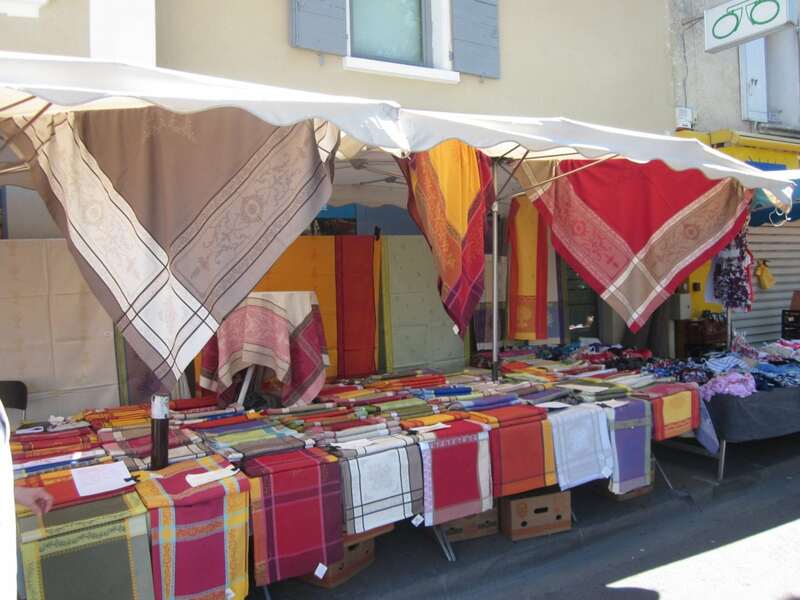 Menerbes– This small town perched on a hillside was a lovely spot to walk and window shop. 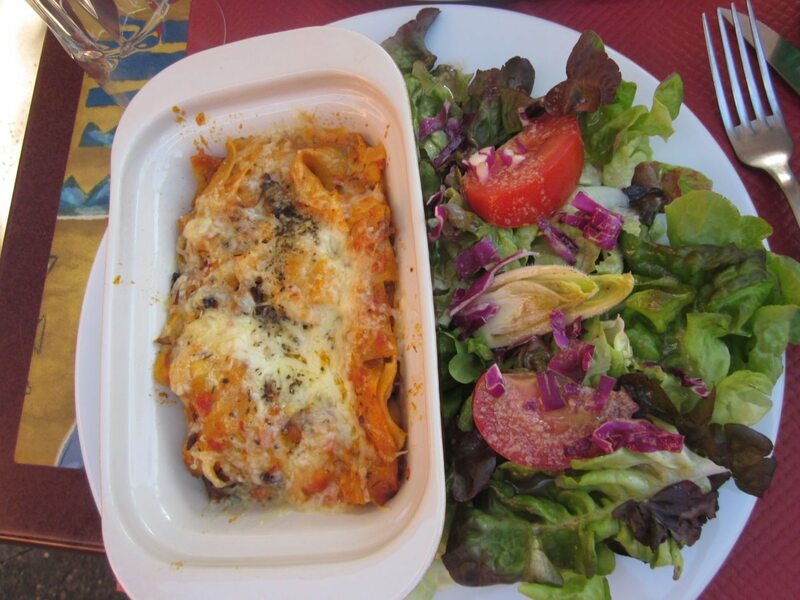 Rick Steves had suggested in one of his shows to eat at this restaurant— Cafe de Prugres. If you walk thru the restaurant and out to the patio, there is an expansive view of the towns below. We enjoyed a soda and the view. There was nothing spectacular about their menu that made us want to stay. Sometimes I just get that vibe and have to do what feels right, regardless of what the travel books may say! Lacoste- Cafe de France is in the movie where Max gave a letter to Christie to meet him for dinner. (You will just have to see the movie to find the details of this sub-plot to the movie.) There are excellent views of Bonnieux from this small village. 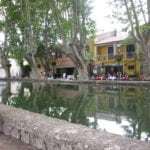 Cucuron-This quaint town is the tucked away village where Max and Fanny enjoy their first date. Picture them in the foreground, at a table enjoying wine and dinner, and at the very far end is a band playing big-band music and there is a movie screen in the background playing an old movie. There are romantic white lights strung across the pond setting the mood. This pond is really huge in the movie and in real life. As they enjoy dinner, it starts to rain. And everyone ducks for cover. It was a great scene in the movie and I just had to find it. It really looks so much like it did in the movie. 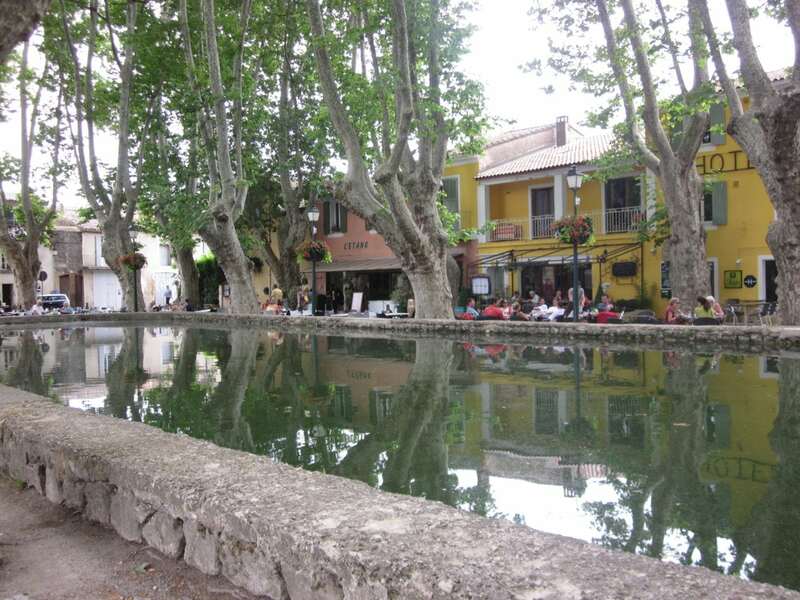 As you face the pond, there is a pedestrian street of restaurants, shops and a small hotel. To the right however if you peek over the fence it is an abandoned building with blown out windows which was quite unexpected. I am not sure how they ever found this little spot of heaven but it was a wonderful find for us. This hotel is in the prefect hotel for exploring this area. It has a lot to offer in spring, summer or fall. Surrounded by dramatic Provence countryside, guests will enjoy every moment in this ancestral home, either relaxing in the shade of the pine trees after a swim, or next to a warm fire in the lounge area when the colors of fall arrive. There are nine guestrooms, breakfast is served in the morning, ample parking, free internet Wi-Fi, and a lovey swimming pool and patio offering shade, views and the sounds of cicada in the evening. 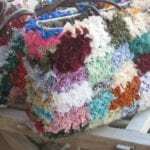 The owners will gladly arrange a dinner at the hotel, on certain evenings. Please ask as we know guests will enjoy their cooking. And also, going out to dinner is not as easy as one might expect. You do not just “pull up to a parking spot” and walk in the door of a restaurant. Airport- We flew out of Marseille. 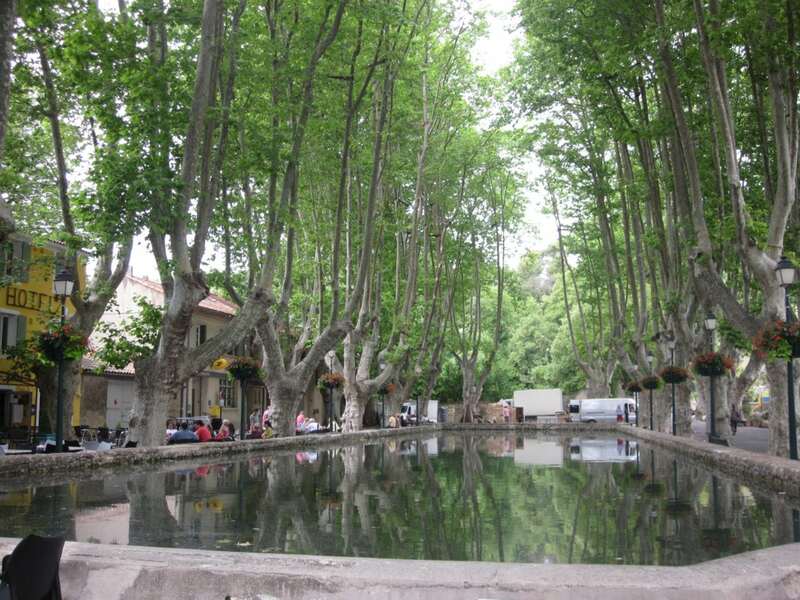 Plan a trip to the nearby large city of Aix-En-Provence if time permits. We spent half a day there and enjoyed it very much. 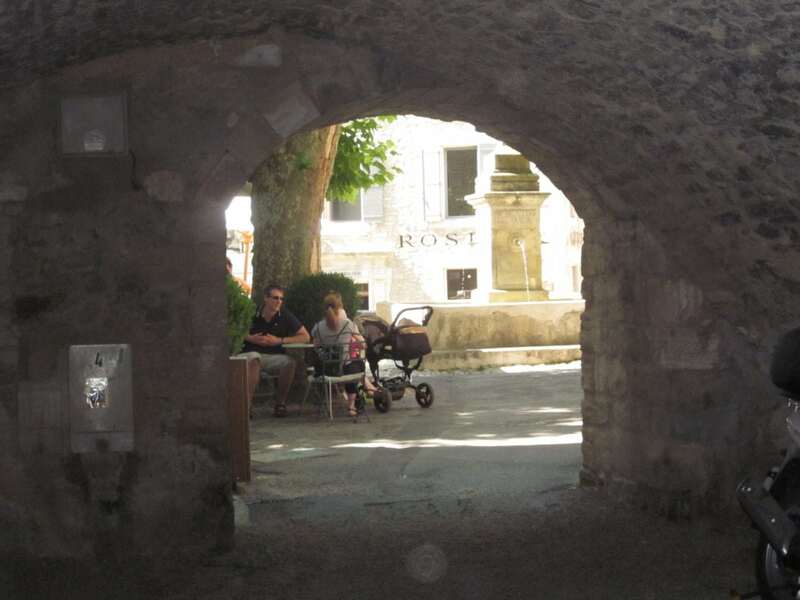 Avis Car Rentals- We picked up our car rental in Avignon and dropped it off in Marsielle. The roadways are very, very narrow so be sure to get a car that is small enough that you feel comfortable driving on less than a lane of roadway. 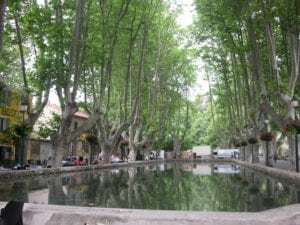 Exploring Luberon in The South of France ~ Often "the destination” itself guides me on my pathway for a trip, yet this time my itinerary was inspired entirely by a movie! I wanted to re-trace the steps and locations featured in the movie "A Good Year." Join me on this fanciful adventure as we meander our way through the south of France, and see the impressive haunts and hideaways where this mesmerizing movie was filmed. 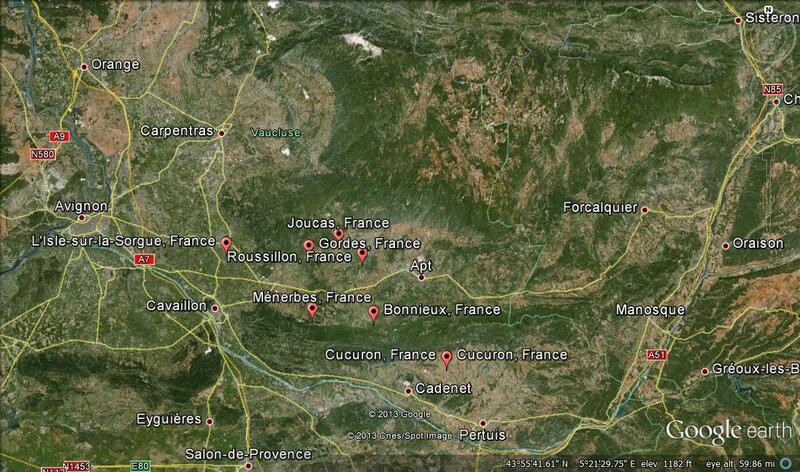 Beginning our exploration of the Luberon area of France, just east of Avignon.